Shetland Black Potatoes have a distinctive dark purple colour and are kidney shaped. The tubers are smaller than modern potato varieties and slightly erratic in shape often being oval with one end being more bulbous than the other. 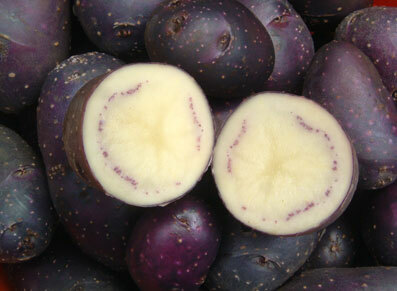 When cut open, the tuber flesh is a pale creamy yellow colour with a ring of purple. The purple is more pronounced in some tubers than others. The colour does not survive the cooking process with the purple in both the ring and the skin becoming a dull grey-brown. The Shetland Black has a sweet buttery flavour. It possesses a light, floury texture and is best cooked in its skin. Potatoes were introduced to the Shetland Islands as far back as 1588, when they were believed to have been salvaged from a Spanish Armada shipwreck. The specific origins of this potato remain a mystery. The Shetland Black was included within the National Collection in 1923. Unlike commercial varieties, Shetland Black potatoes and many other heritage varieties, are not as high yielding. This, coupled with the fact that today’s consumer prefers a white fleshed potato with very few blemishes, has led to fewer crofters growing this traditional variety. The potato is only available in small quantities from stocks grown on the Islands.